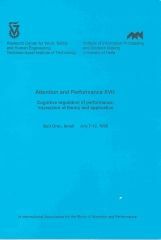 The central theme for the A&P XVII is Cognitive Regulation of Performance, with special emphasis on the interaction between theory and application. The topics to be covered include top-down regulatory processes and mechanisms of attentional control, strategies of performance, conscious appraisal of the world, pursuit of intentions, and the interplay between controlled and automatic processes in skilled performance. We shall be examining existing and prospective applications of cognitive research while also considering the challenges that real-world problems pose for basic research in cognition. We believe that the time is ripe for face-to-face encounter between basic and applied research in cognition, and we firmly believe that such an encounter holds the promise of being mutually stimulating and rewarding. Four sessions are planned, each concentrating on a particular topic. Each session will begin with one or two "focus on application" papers which will replace the tutorial papers that have traditionally introduced a topic at A&P Symposia. The aim of these focus papers is to provide up to date review of progress in an applied area of cognitive regulation, in which a significant and successful exchange can be shown to have occurred between theory and application. These papers are delivered by scientists who have bridged the basic and applied domains in their own work, and are recognized for their contributions to both areas. Other contributors, invited participants and observers, are scientists who belong either to the basic science and/or to the applied research communities.